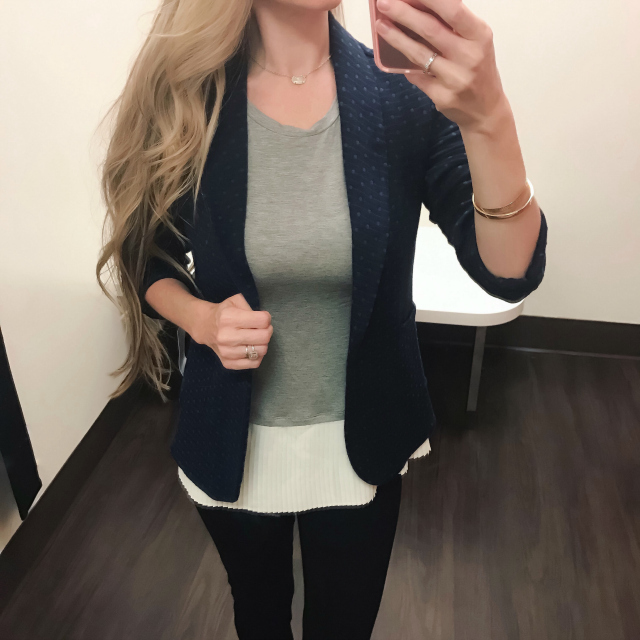 I wanted to quickly share a few more recent fitting room reviews with you, some of which I already posted on my Insta-stories on Instagram and received questions about. A few of the recent releases online caught my eye, so I decided to swing by Macy's to give them a try. 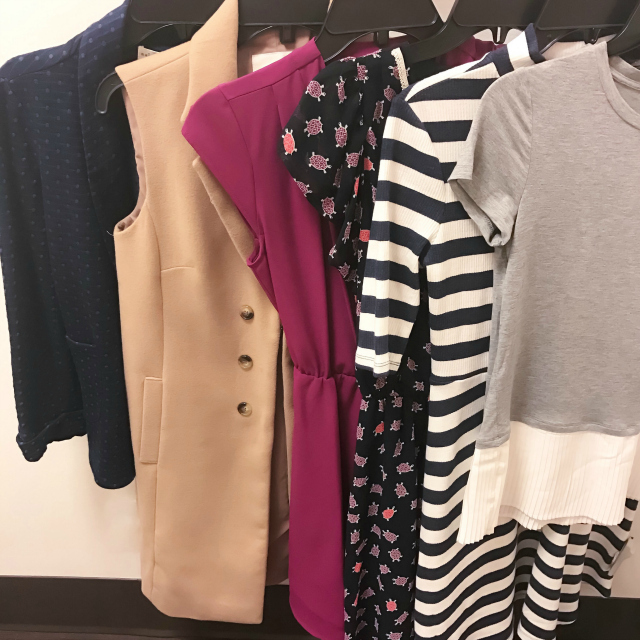 Macy's is currently offering an extra 25% off select regular items and sale/clearance items with promo code "LOOKS" so most of these pieces are less than $50! Yesss! Start shopping the sale by department here. First up is this Striped Fit-and-Flare Dress in size Small. 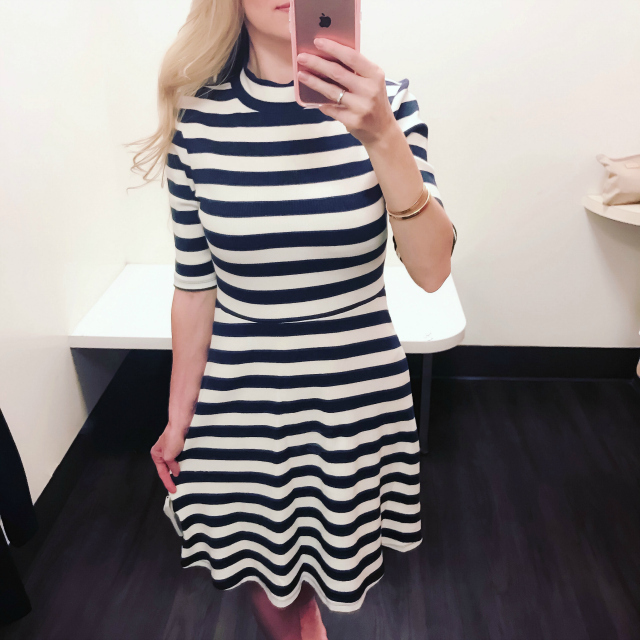 I love a great classic, striped dress, so this one with its navy and white stripes, elbow-length sleeves and mock-neck details is a front-runner for me. It nips in at the waist and gently flares out at the hips for a flattering silhouette. It also hits right at the knees, which is ideal for me (I'm 5'2".) Since I didn't want the dress to be too clingy, I sized up from my usual XS to a S, and the fit was just right. It's adorable on its own, but it would also be a great layering piece for Fall with a cropped jacket or long open cardigan, boots or booties, and scarf. Love it and highly recommend it! Next is this Dot-Pattern Knit Blazer, Pleated Contrast Top, and Rinse Wash Jeggings. I love it and highly recommend it! The only small grievances I have is that the pleats appear to wrinkle/crease easily, as this one shows in a few areas. It would likely require steaming, which makes it higher maintenance. The stiff inner care tag also causes one side of the shirt to jut out in an unflattering way, as you can see on the right side in the photo above. I'm sure this could be quickly fixed with a quick snip of the tag, though. Overall, it's a super cute tee and I would recommend it! These jeggings are oh-so-comfy as well! They look like a dark denim wash but feel like a ponte knit pant. The two front pockets are non-functional but a nice detail; they don't add bulk to a slim-fitting pant as real pockets sometimes do. Since jeggings tend to run small, I sized up from my usual size XS to a S, and they fit nicely. The pull-on styling makes it easy to get them on and off, and I like that the fit is flattering without looking painted on. They're nice and stretchy, machine-washable, and will look great dressed up with pumps or dressed down with boots/booties. Last, but not least is this Gilet Trench Vest in size XS. 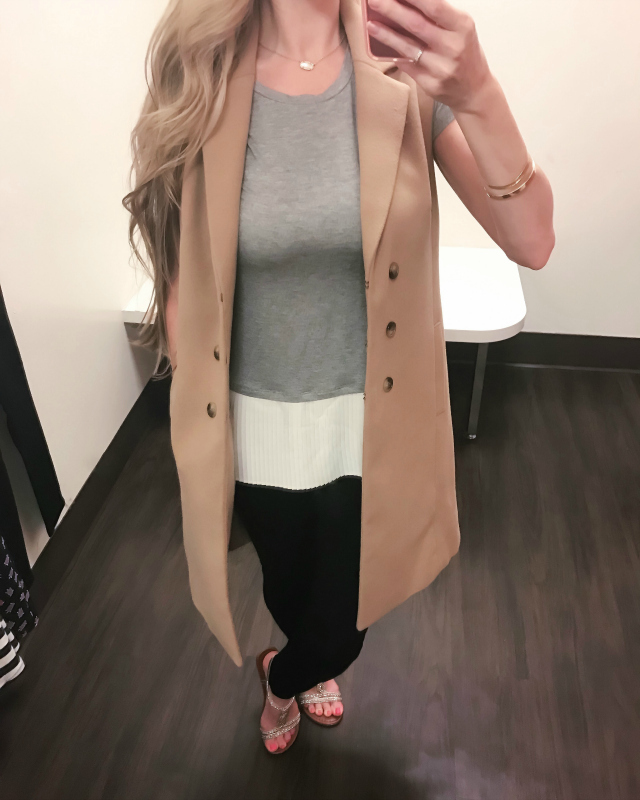 I've been on the hunt for a petite-friendly, classic, trench vest in this color for what seems like ages. This one looked promising online, however, it's quite literally a big disappointment in-person. Even in the smallest size available, it's much too large. The cut is wide and the length is way too long for petites -- such a shame since Maison Jules is known to run small. Here are the ones I tried on plus several other Maison Jules pieces I'm eyeing and that I'm hoping to try on next time. Click on any of the ones you like! Have any of these been catching your eye, too? Which ones are your favorites?